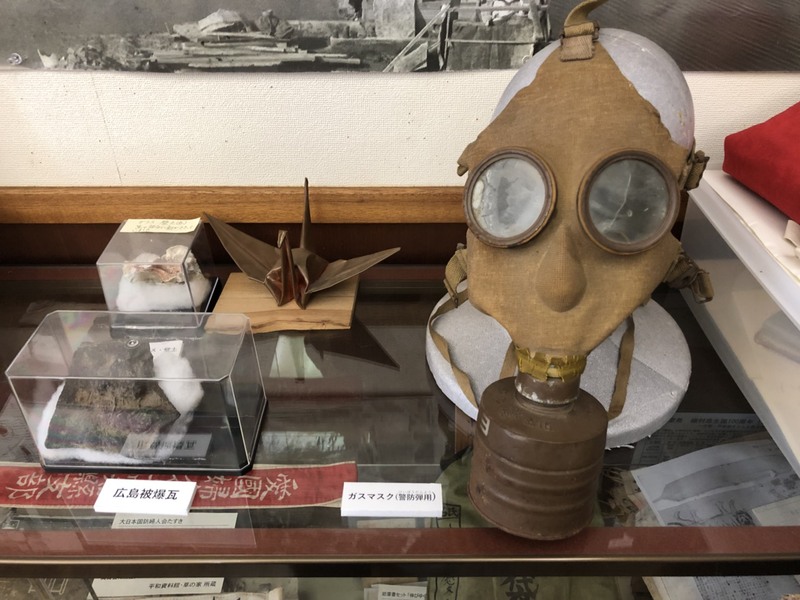 A creepy old yellow gas mask and a folded metal crane welcome visitors to Kusanoie (Grass Roots House), a private facility engaged to convey the fact of war happened in Kochi and the preciousness of peace. These objects have the meaning of misery of War and Peace respectively. People are seeing the boundary world between war and peace in a small room. “What happened in Kochi during the war is not known very much by people in Kochi, not to mention by people outside Kochi, even though that has to be filtered down through the generations,” he added. Kusanoie, typical Japanese house which is in the center of the city, plays a crucial role in the Kochi regarding peace education. There was an exhibition called “Air Raid in Kochi” once a year to widen the awareness of the people toward war and peace. This exhibition has been held annually for 40 years. One day, a few members had an idea for a more permanent display. “We wanted citizens to be able to visit and see anytime they wanted,” said Mr. Okamura. Then in 1989, Kusanoie was established by Mr. Shigeo Nishimori who passes away in 2004. After his death, Mr. Okamura took over his position and took charge in the top of Kusanoie. In Kusanoie, several documents and tools which were used during the war are kept and shown. Surprisingly, most of them like helmets and coins were donated by citizens. Kusanoie holds many events such as exhibitions, mini-concerts and the participation of a festival to catch attention from the people, especially from the young generation. Kusanoie acts not only within Kochi but internationally with China. It has a relationship with a museum in Harbin, China which does extend the awareness of peace to citizens. They exchanged some people with each other to share what they are doing and gave advice on how to run that kind of group. “We are also researching what is related to China about the war, so we are proud of connecting with a group in China which are doing similar as Kusanoie.” Mr. Okamura said. Kusanoie asks some schools in Kochi to make half a million paper cranes in total, and people make them with a strong wish that Japan and China will get on with each other. These paper cranes are hanged on the arcade as a symbol of peace for a month every July. “We are so happy if people see these hanged cranes and not only feel that these are amazing but think about the peace at the same time.” He commented. Kusanoie is run by themselves without financial support from the public organization. Instead of that, they have a membership system that everyone can be if only people pay 3000 yen for adult and 1000 yen for students per year. “We would like you to join our community, we need your positive participation,” Mr. Okamura said hopefully. “In near future, we want to widen the range of community more especially with foreign countries and to do that, we need your kind cooperation,” Mr. Okamura repeatedly said with a big smile. In recent years, there are tons of troubles across the countries like politically, economically, historically and so on. Wow that is really interesting. It is absolutely important to learn how awful war is. This kind of place should be in other places too.